CalMac has launched its 2018 Travel Trade Product Planner aimed at helping coach and tour operators to discover the beauty of Scotland's west coast. CalMac has launched its 2018 Travel Trade Product Planner aimed at helping coach and tour operators to discover the beauty of Scotland’s west coast. It was launched at the Coach Tourism Associations Annual Coach Holiday Conference in Bournemouth to great interest from around 50 of the UK and Europe’s most influential coach operators, tour organisers and tour wholesalers. The planner has been developed over the years and has been widely praised by the travel trade industry as an invaluable and creative reference tool – in some cases better helping them to understand the geography of the area, together with hints and tips about what to see and where to go. Among the pages, travel trade operators can also find details of recommended tours, including two new additions for 2018 – a sightseeing cruise to the Isle of Mull and a chance to take in history with a tour over the sea to Skye. 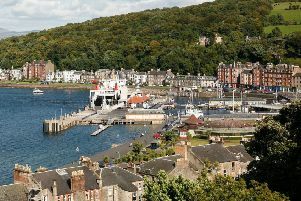 These two new packages join other more established routes taking in the likes of the Isles of Arran, Islay, Bute, Gigha, Rum, Iona, Staffa, North Uist and Harris, as well as a tour of mainland Argyll areas incorporating a crossing from the village of Tarbert on Kintyre to Portavadie on the Cowal Peninsula. The brochure also features useful information for tour operators about what they and their customers can expect on board various vessels which serve the areas, including some of the local produce available, as well as information about the major vessels in the fleet and, importantly for tour planners, coach fares for 2018. “We hope that this brochure offers inspiration for coach and tour operators, allowing them to incorporate creative and varied packages into their own itineraries,” said CalMac’s senior travel trade account manager Ian Fox. “The comprehensive information we provide is a combination of not only our own experience and knowledge as a transport operator serving the west coast for more than 165 years, but also that of the areas and businesses involved. “Operators can, therefore, be confident that what we have pulled together offers both good value for money and great insight about the beautiful places we visit.